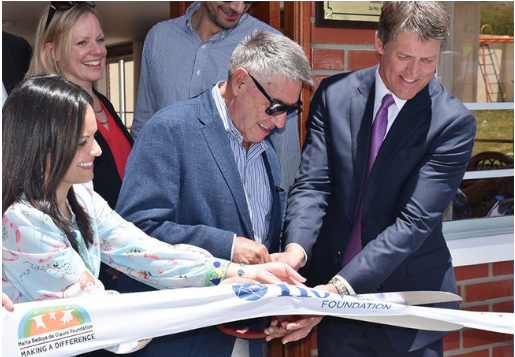 MADISON, Wis., Feb. 25, 2019 /PRNewswire/ — In the area of Huajchilla, Bolivia, south of the city of La Paz, a new home named “Hovde House: Marta Bedoya de Claure” has opened its doors for thirty vulnerable girls and teenagers living in the streets. The construction of this project was possible thanks to a partnership made in 2017 between the Hovde Foundation, Maestro Cares Foundation, Marta Bedoya de Claure Foundation, and the Bolivian partner ALALAY Foundation. The “Hovde House: Marta Bedoya de Claure” aims to reach a greater number of children in situations of social risk and help them restore their fundamental rights. To this end, ALALAY Foundation provides a holistic approach that includes shelter, balanced meals, education, technical skills, and healthcare to the girls that live in the house. During the inauguration, all four non-profit organizations were present as well as Bolivian Children Rights Institutions, friends and all the girls who will live at the house. The Hovde Foundation was founded in 1998 to support two central missions: finding a cure for Multiple Sclerosis and helping vulnerable children and families in the US, Latin America, and Africa. The focus of the Hovde Houses is to provide shelter, health, community development, and youth education to children in crisis. There are nine Hovde Houses in Mexico, Ghana, Guatemala, Kenya, Malawi, Peru, Rwanda, Bolivia, and Wisconsin, USA and one new home in progress in Honduras. The Hovde Foundation with its Hovde Houses initiative serves over 500 children a year. Maestro Cares Foundation is a nonprofit headquartered in Chicago. The foundation aims to improve the quality of life of orphaned & disadvantaged children in Latin America & the United States. The Foundation does so by raising resources and collaborating with corporate and nonprofit partners to provide housing, educational programming, and the essential resources to support their growth and development. Since the launch of its first home for orphaned boys in the Dominican Republic in 2014, the foundation has since opened three youth homes in Colombia, Mexico and Puerto Rico, two community centers; one in Guatemala and one in Colombia, and two foster homes in Bolivia, and funded an interactive program in Peru that provides educational tablets to over 300 children in Lima. All together the foundation has helped to provide safe and healthy environments for over 400 orphaned and disadvantaged youth. This year, the foundation initiated new projects Cali, Colombia and San Salvador, El Salvador, Santiago de Chile, and Jalapa, Guatemala. The Marta Bedoya de Claure Foundation (MBDC Foundation) is a non-profit organization that was founded in 2010 by Marcelo Claure. The main activity of the foundation is to provide donations and grants to other charitable organizations that support education, health and poverty alleviation. The foundation also has a focus on supporting children affected by cancer through its grant-giving activities. ALALAY was founded in 1990 in La Paz, Bolivia through the initiative of Claudia Gonzáles, the current Director of the foundation. It was conceived with the mission to recover boys, girls, and teenagers who have taken to the streets as their home, constructing opportunities, encouraging restitution, and exercising and promoting their fundamental rights.